Adding a coloring agent to WEST SYSTEM® Epoxy is frequently done to make colored castings, highlight an epoxy coated surface, act as a colored base coat for paint, etc. Most powdered pigments are satisfactory, as are acrylic paste pigments and universal tinting pigment. Adding pigment to epoxy should, like everything in life, be done in moderation. Without exception, adding pigment to WEST SYSTEM Epoxy will weaken the cured mixture to some degree. Because of this, we suggest you use very small amounts of pigment, about 5% by weight. As a result, thin films of colored epoxy are somewhat transparent. It usually requires several coats to make the film opaque. 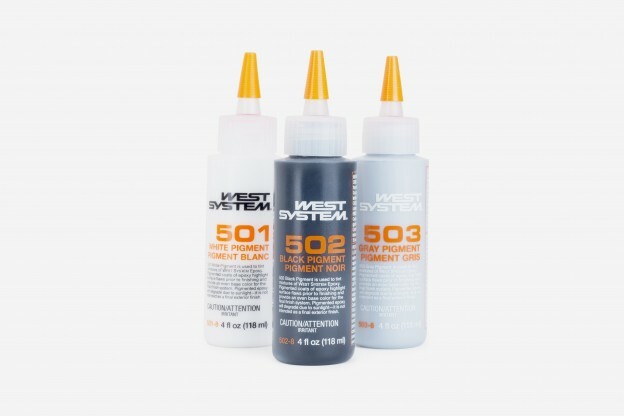 WEST SYSTEM pigments are available in three colors, white, black and gray. We suspend the pigments in an epoxy resin base which allows them to blend thoroughly into the epoxy to make very uniform colors. Because the pigment has an epoxy resin base, it is important not to add more than the recommended amount. Adding an excessive amount of pigment to the epoxy could alter the resin/hardener ratio, compromising cured epoxy performance. Aniline dyes—water based versions—are powdered coloring agents used to make stains. They come in a number of colors and wood tones. When used to tint epoxy, aniline dyes do not weaken the mixture as much as some types of pigments. Aniline powder, however, does not dissolve in the epoxy. When you view the colored mixture closely, you can see the individual powder particles. Powdered tempera paint, wood sanding dust and many other inert powders will color epoxy in the same way. Experiment. It’s always a good idea to a test batch, especially if you’re trying to match a specific color. Paste pigments such as artist’s acrylic pigment seem to weaken the epoxy more than the addition of dry powdered pigments. However, acrylic pigments mix into the epoxy more evenly than powdered pigments. Additionally, they are available in a multitude of colors so if the strength of epoxy is not an overriding issue, artist acrylic makes an acceptable colorant. If you need to make a tinted epoxy putty for filling defects, mix WEST SYSTEM epoxy with 406 Colloidal Silica Filler to make the putty. The addition of 406 to the epoxy results in an easily colored, smooth, off-white paste that can be tinted with one of the pigments. Epoxy, tinted or clear, does not have good UV light resistance. An epoxy coating exposed to UV will yellow, become opaque, and eventually flake off. This process takes a while and if the object you are coating has limited exposure to sunlight, a colored epoxy coating will hold up for years. WEST SYSTEM dealers carry our 501 White, 502 Black and 503 Gray Pigments as well as 420 Aluminum Powder which makes a metallic gray mixture, and 423 Graphite Powder which makes a black mixture when added to the epoxy. Acrylic pigments and universal tinting pigments are available at art supply stores, paint stores, or craft supply stores, and some mail order tool catalogs. Aniline dyes are available through many woodworking suppliers.